More than any other manual therapy, Thai bodywork tunes you in to your body and focuses your mind. Laughter is the best medicine. A session with my teacher Ajahn Pichest Boonthume. Therapeutic Thai bodywork, also called Thai Massage, Nuad Boran, or even Thai yoga stretching, offers an exceptionally rich framework for holistic treatment of body, mind, and spirit through manual therapy. It feels great to receive and you feel great afterwards. It's a combination of deep acupressure, shiatsu and assisted stretching or yoga - one session may include foot massage, abdominal massage, and facial massage. It's a unique feeling that many people find addictive. Thai massage is ideal if you feel out of balance, stressed out, anxious or fatigued. It can also help with musculoskeletal issues and general health. Thai bodywork consists mainly of deep compression, stretching and awareness of breath.. I incorporate other approaches and tools as needed, including acupressure, tapping or striking, shaking or "shuffling," vibration with a wooden mallet (tok sen), direct manipulation of nerves and tendons (jap sen), herbal compresses, use of oils and balms, and scraping (haaek). Just as important is the intention of the therapist, which should embody the concept of metta or good-will to all beings as well as karuna (compassion) and upekha (equanimity). There are many different ways to do Thai bodywork - my approach draws most from my main teachers in Chiang Mai, Thailand, Ajahn Pichest Boonthume. Pichest's teaching emphasizes empathy, deep "listening" to the body, and a slow, relaxed approach to release "blocks" or restrictions to movement. I continue to return to Chiang Mai as often as possible to continue studying and reconnect. 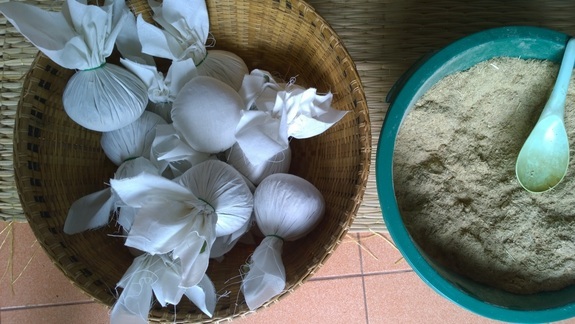 Making herbal compresses to be used in Thai massage. Sessions are done on a mat on the floor. You will wear light, comfortable clothes like a T-shirt and fisherman pants that allow the body to be moved - no need to get undressed. Oil is not used, except for localized use of balm. There is no set routine - every session is tailored to what is needed and appropriate for you, adapting pacing, techniques, and pressure. Individual sessions draw on whatever techniques and approaches are needed. How people feel after a session depends on what blocks were released - some people will feel relaxed and calm, but many report feeling invigorated and having more energy. Tok sen - a very traditional, distinctive therapy from Northern Thailand which uses vibrations to work connective tissue, nerves, and bone. It is a very relaxing modality suited for those who cannot receive deep pressure or who have deep issues that cannot be reached through massage . You don't need to choose a specific type of Thai therapy - just say you want Thai Bodywork and come in. We'll discuss what you want to decide what approaches to take. The following therapies are available if you want something specific. General balancing sessions: General sessions are appropriate for those with no specific complaints who feel overall tension or imbalance in their systems. For cases of high sensitivity, more severe imbalance or depletion, herbal compresses may be used. Sessions last 90-120 minutes. Deep-tissue structural Thai sessions: This is slow and deep work to address severe or chronic tension patterns. These sessions are good for almost everyone but particularly good for those with more strong muscles and/or dense connective tissues. This work may be done as a whole-body session or address a specific area of imbalance. Sessions last 90-120 minutes. Therapeutic sessions: These sessions are appropriate where there is a specific area of pain or unbalance. Work is focused on the area of imbalance and may include deep tissue structural work, jap sen (nerve work), and other modalities as needed. Cool or hot balm may be used as needed. Sessions last 60-120 minutes as needed. Tok sen: Tok sen is a very traditional Northern Thai therapy which uses vibrations to effect the energy lines. The vibration is supplied by tapping a wooden peg along the key lines.. This work is very deep (because vibrations travel into the body) but also low-pressure and non-invasive. It is especially appropriate for those who either cannot take deep pressure or much movement (because of age, skin condition, or strength of bones and underlying tissues) or those who have not responded fully to pressure treatment. Sesame oil may be used as needed. Sessions last 75-90 minutes. Thai abdominal massage session (chi nei tsang): Thai abdominal massage or chi nei tsang works on the belly, organs, and thorax to achieve general balance. This is a general abdominal massage. Sesame oil is used for this massage; session typically lasts 1 hour. Thai cranial/facial massage: A massage session in Thailand often ends with a facial massage, which makes sense since most of the energetic lines end in the face and cranium. In Thai healing theory the head has special significance: energy or lom enters and leaves the body through the crown of the head. Separate cranial/facial sessions are offered both for those who want to release tension stored in the jaw and face and have a rejuvenated look or who need specialized therapeutic work (e.g. for headaches, jaw issues, etc). Sessions last 75 minutes. Thai facial massage from a legend of Thai massage, Mama Nit Chaimongkol. I was lucky enough to meet Mama Nit in the last year and a half of her life. She was a wonderful therapist who loved teaching.